I had an interesting conversation with one of my good teacher friends from Atlanta about the Netflix show Stranger Things – haven’t seen it? Scroll to the bottom for the teaser trailer. Our conversation really resonated in a way I did not expect and got me thinking about what Jenny said. If you have not seen Stranger Things, don’t worry – this will all come together. This series takes place in the early 1980’s, complete with music we love, clothes we can’t believe we wore, hair styles that seem to be coming back and all other things 80’s. Do you remember the rotary phone? And that if you were on the phone, there was no call waiting? People calling you, while you were on the phone, got a busy signal. They had to call you back. Did you have a boom box? One that took 8 “D” batteries and weighed 10 pounds? Did you record your favorite songs from the radio onto your mix tape? Remember a life with no text messaging or email? Did you ride your bike around the neighborhood from the time you got home from school until it was dark? How about the open concept classroom design, or the terrible home decor – all of these wonderful things are recreated in this Netflix series. 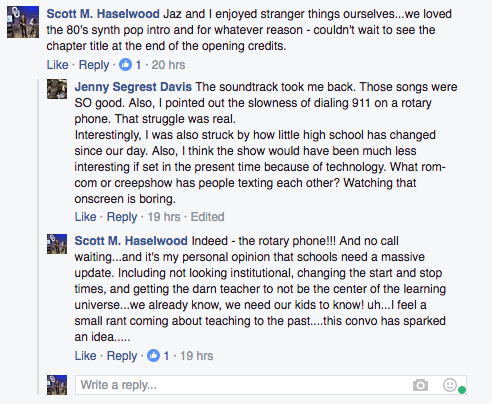 My friend commented about how similar the school portrayed in Stranger Things is to the schools we teach in today. There were the desks in neat rows, facing the front chalkboard. The metal lockers. The different groups of students: the nerds, the smart kids, the socially outcast, the bullies. So many of these things are still visible today. I know that getting all students to get along every day is a tough task, but there are ways to break down some of the barriers that our students have erected between themselves and the staff. People are different – we can help our students celebrate the diversity that exists in our schools, rather than create silos and animosity. Have discussions about the difference, recognize that we all think differently and that all of our voices are important. Why is it that a teacher from the early 1980’s can walk into our classrooms and feel right at home? Why is this acceptable practice? For those of us who went to school before AOL introduced us to chat rooms and email, the only place we could get information was from the library or a teacher. If our parents had made an investment in Encyclopedia Brittanica or the World Book Encyclopedia we were lucky. We did not walk around with the entire world in our pocket. With the ability to find information on demand and with the political slant, we prefer. As teachers, we should be seeking ways to reach out to our students, to meet there where they are. They are on social media. ALL THE TIME! Let’s meet them there. One example: create a professional Snapchat account and have your students follow it. Then use your Snapchat to teach your students. Give them a teaser about something coming up. Show off the brilliant things they are doing in your classroom. Use it to encourage them. Send possible homework options. Reach out to Kas Nelson – she does a great job with her school. In the show Stranger Things, there is the Upside Down world. This world is a dark and shadowy version of reality. Scary things live there. Death lives there. The danger is constantly lurking around every corner, behind every tree. Some of our students live in the Upside Down world. Their lives are overloaded with dark and shadowy things. Students who are homeless, or who struggle to find food, or a safe adult to live with – these young people are constantly living in the Upside Down world. When children are hungry, learning becomes difficult. If students do not have a safe place to sleep at night and are hyper-alert to their surroundings, learning becomes difficult. When students have learned through their life experiences that adults are not to be trusted, learning becomes difficult. 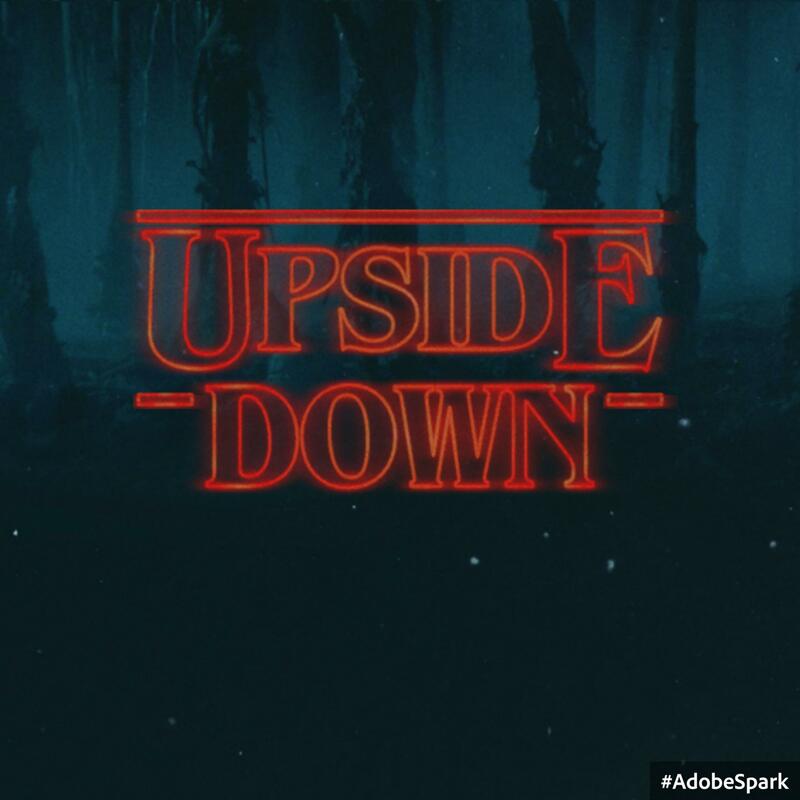 We should stop a nothing to rescue our students from the Upside Down world. Nothing. The education that students receive is determined by the zip code of their address. Think on this for a minute. Look at the current metrics that are used to evaluate our schools. Schools that struggle are typically located in economically challenged neighborhoods. What are we doing to help these students? Are we attacking the poverty our children live in with the zeal that we cheer on our favorite sports team? Are we working to craft policy to help our least fortunate students have the opportunity to focus on education? What exactly are we doing to pull these students out of the Upside Down. According to a newsok.com article, almost 25% of our children are living in poverty, with 30% of children who have parents without secure employment. Compare that to Finland, where childhood poverty is one of the lowest in the world at 4.3%, according to a UNICEF study. Apples and oranges I know. But Finland has figured out a way to pull their students out of the Upside Down. We may not be able to replicate what they have done, but can we not pull some of their ideas into our thinking? 1. Include teachers when crafting policy, use them and research for guidance. One Response to "Stranger Things and the Upside Down World"
I have a masters degree and 15 years experience in public and private schools in two states; I’ve lived abroad and traveled the world; I’ve worked with students in various capacities for over a quarter century. An educational system that asked for my insight would definitely qualify for an episode of Straner Things. And that is a pretty damning statement against the system itself.